Wearing the decoration of the Légion d'honneur without having the right to do so is an offence. Wearing the ribbon or rosette of a foreign order is prohibited if that ribbon is mainly red, like the ribbon of the Légion. French military members in uniform must salute other military members in uniform wearing the medal, whatever the Légion d'honneur rank and the military rank of the bearer. This is not mandatory with the ribbon. I just found out that I had been proposed for the Legion of Honor. I reject this appointment and I do not think it is the role of government to decide who is honorable. It would be better that it be devoted to recovery growth in France and in Europe. Now I'm really confused. I got the idea - perhaps mistaken - from Capital in the Twenty-First Century, that Piketty viewed unfettered market outcomes as seriously deficient. Society could be destroyed as the result of capitalism run wild, or some such. Is he now telling us that there is a market for honor? If you want a reward for your good deeds, you should write your own 700-page tome, and see if it meets the market test, perhaps? Maybe he has found religion, and thinks that honor is found in heaven. Inquiring minds want to know. My suggestion is that we run an experiment. Anyone with any power to decide such things should nominate Piketty for their award, and we'll see which ones he takes, if any. I would be happy to put him up for the Hillcrest Neighborhood Holiday Season Light Display Award. I'll have to convince the neighborhood association to waive the usual rules, but that could fly. You should recognize at least some of the names of these estimators-of-Phillips-curves. Some of them are still big shots. What was the conclusion from that work? So, if we look only at the 1981-82 recession which, according to the NBER, is defined by a peak in 1981Q3 and a trough in 1982Q4, the drop in the quarterly PCE deflator was about 3.6%, or an average of 2.9% per year. By Okun's estimate, this should have resulted in a 29% drop in GDP per year. What actually occurred was a drop in real GDP during the recession of about 2.5%, or an average of about 2% per year. If Okun was feeling pretty smug [infeasible actually (see the first comment below), but imagine he were still alive then] about all this by the mid-1980s, I'm not sure why, given that he was off by an order of magnitude. For the uninitiated, "incomes policy" means wage and price controls. Tobin is saying that the cost of using wage and price controls to control inflation is small, with the welfare distortions measured by "Harberger triangles," but the cost of using conventional policy to control inflation is a potentially very large output gap. As with Okun's policy recommendation, Tobin's went by the wayside. 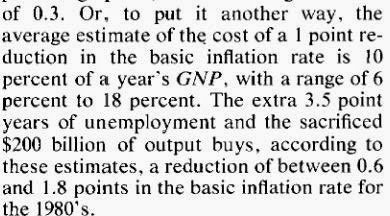 In contrast to Okun, who is quite pleased to supply an estimate of the cost of disinflation, in terms of lost GDP, Sargent doesn't think he has a serious model that he can take off the shelf to address the quantitative implications of disinflation. 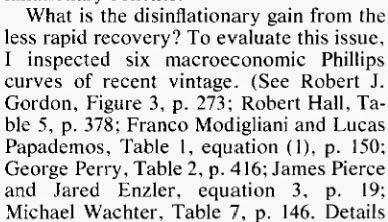 But, his two papers provide nice historical examples of disinflations (in some cases the ends of hyperinflations) that are quick, and that seem to conform to his ideas. So, who were the winners and losers from this episode? Probably that's the wrong question to be asking. When science progresses, we all win. Science does not progress when individual scientists see it as a loss if their ideas are superseded, and try to prevent that loss from happening by denigrating new ideas. 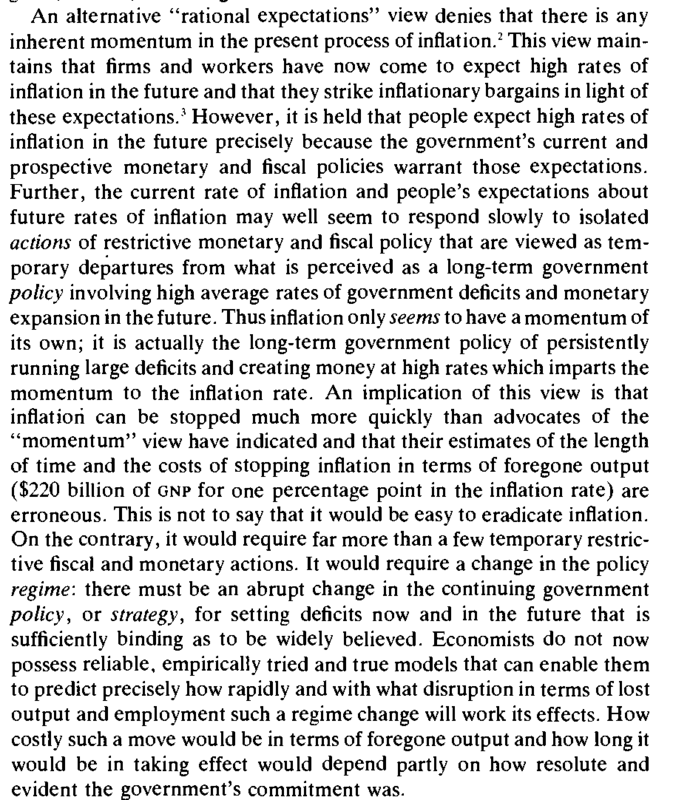 Careful re-examination of the Volcker disinflation might lead to the conclusion that Volcker should have done something different, but I think the consensus view among economists is that the Volcker disinflation was necessary, and whatever output was lost in the process was outweighed by the benefits of low inflation that we have enjoyed for the last 30 years. The idea that we should control inflation through tax/subsidy policy or wage/price controls gets no traction in the 21st century. It's now widely accepted that inflation control is the province of central banks, though we owe that principally to the Old Monetarists rather than the 1970s macro revolutionaries. But those revolutionaries gave us much of the framework we now use for addressing monetary policy problems: (i) we want to think in terms of policy regimes rather than policy actions; (ii) commitment is important; (iii) well-understood policy rules are important; (iv) people are forward-looking. All of those ideas are now common currency in central banking circles. People who succeeded as macroeconomists in the post-1980 world absorbed the ideas of Sargent and his contemporaries and worked with them - you can certainly see that in Woodford's work, for example. Are these long-gone controversies which have no relevance for current policy issues? Certainly not. 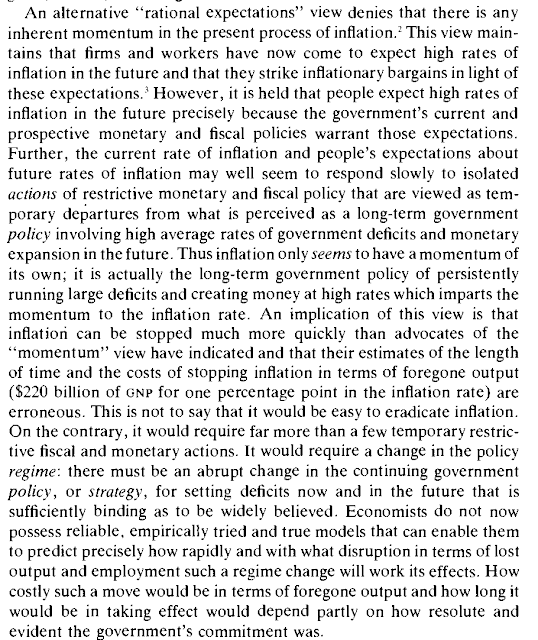 In the messy world of monetary policy-making, we can still find people who want to think about monetary policy in terms of actions rather than state-contingent policy rules, or who want to base policy decisions on things akin to an estimate of the slope of the Phillips curve. People with the resolve of Paul Volcker are unusual, and institutional commitment can be difficult when there are many people with disparate ideas weighing in on a policy decision. what does he do? He takes a Lucas cash-in-advance model off the shelf - a model with forward-looking optimizing economic agents having rational expectations - and uses it to learn something. He's a rational expectationist too!